"McDonald's!" That's the default answer I'd get when I ask what the family likes for (fast food) delivery. It's getting to be a "tradition" of bonding over burgers and fries! I know, I know, it's bad. I try really hard to limit our fast food consumption to twice a month. It's usually either a tub of Jollibee Chicken Joy or McDonald's hamburger meals for delivery. Okay, someone will shoot me for using those two burger joints in one sentence! (LOL!) But it's true, those are our usual orders. Last weekend, even with the phone just a few feet way, hubby decided to check McDonald's online from his iPad and bingo! McDelivery Online. Dinner solved. 3 quick and easy steps and you're done! What amazed us was the fact that after just about 2 minutes from completing our online order, we got a call from McDonald's to confirm our orders. And within 20 minutes, our burgers and fries arrived at our doorstep! Dinner is served. Email confirmation of orders too! Count cars - Make your friends choose a car make/brand. Once everyone has chosen a brand, try to compete with each other by counting the number of cars of your choice that pass by. Take Pictures - To keep your travel journal more interesting, try to take pictures of funny signages, fascinating people and breathtaking view. Play What's Next - Pick an interesting topic (i.e. animals with 2 legs). Then take turns naming one thing/animal/person that belongs to the group/topic. Person who couldn't answer loses. Spot the yellow car - Keep your kids on the lookout by spotting yellow cars. The one who spots the most number of yellow cars in 3 minutes wins. Alphabet game - Take turns naming a country, animal, or city that begins with the letter "A" followed by "B" and so on. Eat - Playing all those fun games can make you really hungry. 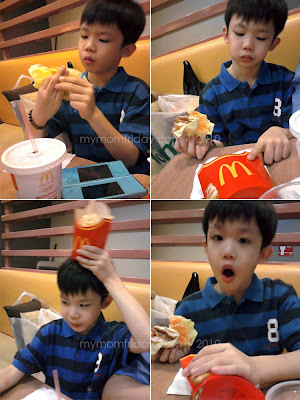 Turning 7 years old last November, he only requested to dine at McDonald's to eat cheeseburger and fries! Let me just say this is not a sponsored post! :) We're just regular happy customers, whether dine-in, drive-thru, or via delivery, McDo is top-of-mind, especially for the kids.